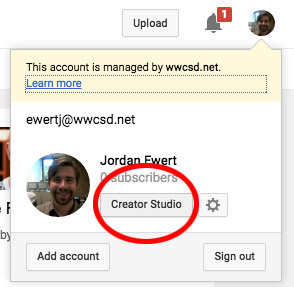 The following tutorial will demonstrate how to most effectively set up a YouTube Live “Broadcast” for your school. To be logged into your YouTube channel with verified status. Access to the broadcast accounts spreadsheet with times & dates. A chromebook, tablet, or iPad with a front-facing camera. First, make sure you are presenting from a YouTube channel that’s verified. To see if this is the case first log into google account and then visit https://www.youtube.com/features and look for the bolded “Verified” status next to your accounts name. If your account is not verified watch this video and follow the steps. It’s pretty easy, just make sure you have your cell phone or classroom phone next to you. In this example I’ll be using my personal account for demonstration purposes. 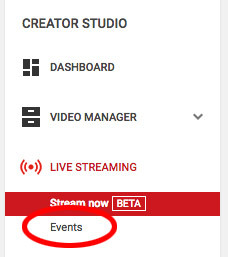 Once you’re in creator studio you’ll be taken to your video dashboard, which showcases all your uploaded videos (if any) and gives you some options. If this is your first time scheduling an event you will see this message above.